DeAndre Yedlin is a professional American soccer player for Newcastle United and the national team of United States. He is a multi-talented player and can play as a right back, wingback as well as a wide midfielder. However, he mainly plays as a right back. Furthermore, he also played for the Seattle Sounders FC and Tottenham Hotspur. DeAndre Yedlin was born on July 9, 1993, in Washington, United States. He was born to Rebecca Yedlin and Larry Rivers Jr. Yedlin grew up along with his younger sister Jenna. He started playing soccer since his childhood. Yedlin attended O'Dea High School for his early education. Well, he is the graduate of the University of Akron. Yedlin started playing football since his childhood and also played for the O'Dea High School. He played for the school team from 2006-2009. Besides his school career, he also played for the Emerald City FC and Northwest Nationals. After that, he played for the U.S. Soccer Development Academy. However, he played the 2010–11 season for the Seattle Sounders FC. After his school career, he joined the University of Akron on February 8, 2011. He continued his soccer career in the college too. During his sophomore years, DeAndre played 22 matches and finished the following year with six assists. Well, he also played for the Seattle Sounders FC U-23. After his college career, he signed for the Seattle Sounders FC on January 11, 2013. Well, he became the first homegrown player. Yedlin made his first debut on March 2 against Montreal Impact. Within his first match, he became the first rookie player to earn MLS Team of the Week honor. Moreover, on July 15, he was named to the MLS All-Star team. Later, on August 13, 2014, he left the club and signed four contracts with Tottenham Hotspur. Well, on January 7, 2015, he trained with the team for the first time. However, on January 9, 2015, he played his first match with the club. Besides this, he started playing on a loan for the Sunderland on September 1, 2015. He also played the premier league for the club against West Ham United on October 3, 2015. Coming to 2016, he signed a five-year deal with the Newcastle United on August 24 for £5 million. He made his debut for the club on August 27, 2016, against Brighton and Hove Albion. Yedlin has also played the international matches. Well, he played his first international match in the 2013 FIFA U-20 World Cup. Moreover, he also played the 2014 FIFA World Cup. 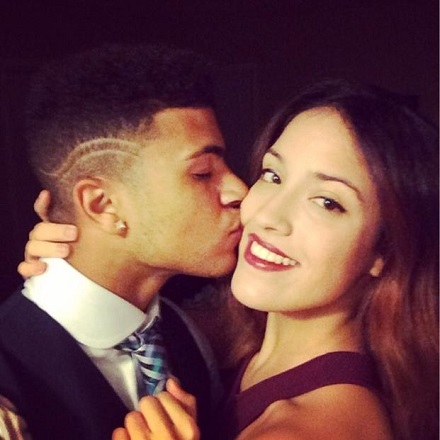 The 24 years old, DeAndre Yedlin is not married yet and having children is out of concern. However, in 2013, he was in a relationship with his girlfriend, Mackenzie Schoener. They were often seen spending their time together. But they failed to continue their relationship and got separated. These days he is romantically linked with his second girlfriend, Tristin Mays. This couple is happily enjoying their love life and is often seen in public together. Till now they haven't revealed anything about their marriage. Hope they will soon tie a knot with each other and lives a happy married life ahead. Yedlin is an American by his nationality. Multi-talented youngster, DeAndre Yedlin deserves to have a good net worth and salary. However, till now he hasn't disclosed anything regarding his net worth and salary. On August 24, 2016, he signed a five-year deal with Newcastle Newcastle United for £5 million. He is also active on social sites like Instagram with 264k followers, Twitter with 368k followers and on Facebook.